December – Hindemith.The temperaments,well tempered . The past months have been so crazy.I have managed to quite painlessly survive them. I have been keeping myself very fit by jogging nearly every day , even if I was travelling like crazy ( luckily most of hotels have gyms and I became absolutely dependant on them) and I have managed to keep my mind cool despite changing lots of repertoire ( Tchaikovsky 1, Ravel , Brahms 1 , Liszt 1, Beethoven 3, recitals,de Falla’s Nights in the Gardens of Spain). And here comes one of my favourite pieces of music. The 4 Temperaments by Hindemith.Not exactly a piece that is going to please a big crowd, but definately something that amazes me every time I perform it. The piece is formed as a Theme with 4 Variations, each Variation reppresenting one of the human temperaments: Melancholic, Sanguinic, Flegmatic and Choleric.The piece has an additional meaning for me since it way my father, Ranko Filjak ,that gave its Yugoslavian premiere back in the 1950′s accompanied by the Zagreb Soloists and the legendary Antonio Janigro. The performance itself has anothe meaning for me : it is with the strings of the Torino Philharmonic. My first meeting with this orchestra was in 2007 when they accompanied me as I won the 1st prize at the Viotti competition in Italy. Since then we have performed together and I was so happy to discover that their wonderful concertmaster was equally in love with Hindemith as I was. The several days rehearsing there were an absolute pleasure of sharing and discovering together deep,meaningful and sometimes very secretive music. As I came back to Berlin all of my friends have gathered to celebrate my birthday together with me. Because I travel so often I don’t nearly see them enough ; but I was so grateful for their presence and their support in my life. Some wonderful presents were given and received. A December to remember all together! 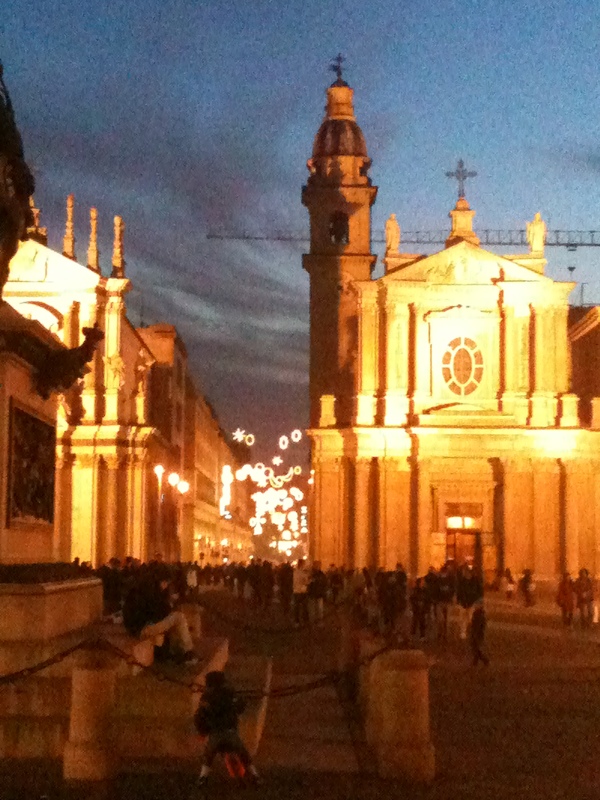 And here a picture I took in Torino. It is a wonderful city ,and as I was walking there after rehearsal the atmosphere in the air seemed magical. This entry was posted in Uncategorized by Martina. Bookmark the permalink. What a beautiful piece of music. It reminded me of some Shostakovich I love. Looking off to the side on Youtube, I now see that you have also performed the latte’rs Concerto for piano, trumpet and strings, to which I’m listening now. Delightfully amazing! Thanks Andrew!Hindemith is indeed a great piece of music and unfortunately very much ‘underappreciated’.I am happy to give at least a small contribution.Have to continue catching up on my blog writing! You are most welcome! I was curious afterward to see if there was a piano reduction of the string section so it could be performed for two pianos and sure enough there is such a score. I am looking forward to showing this to a friend who is pianist in town. I am looking forward to reading more of your entries in your blog. Please do write away and keep us all abreast of your activities and achievements. I have been promoting knowledge of you amongst my patients as I have quickly become an admirer of your repertoire and performances. Martina on December – Hindemith.The temperaments,well tempered .